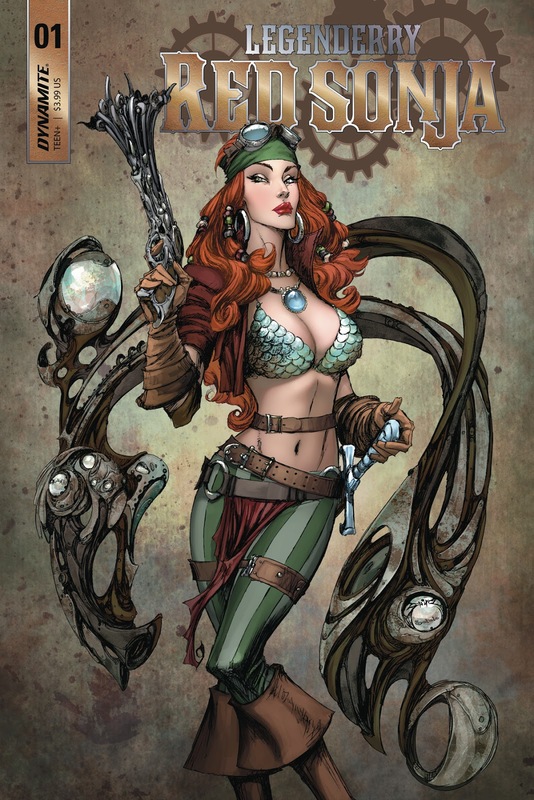 Red Sonja is off on another 'Legenderry' adventure as Dynamite's steampunk alt-word series returns with Marc Andreyko and Igor Lima. Anytime you enter the 'Legenderry' world it's best just to grab a bowl of popcorn and enjoy the ride. Especially, when Andreyko is handling the writing duties as this is just one fast-paced thrill ride where you throw out regular continuity and just accept Sonja as a Pirate Queen, because why not? We find our beloved She-Devil where else but in a tavern playing cards against a local crime lord. She calls out his cheating and things devolve from there. She's suddenly on the run with a bounty on her head racing across town. She summons her crew in her submarine, that's right her submarine, to try and escape a town full of trigger-happy opportunists. A mysterious on-looker becomes an unlikely stowaway. This is just a fun adventure driven by Sonja's signature persona - fearless, confrontational, with a sly sense humor. Andreyko makes sure we know Sonja is in complete control even when things go haywire. But he also shows her soft spot which will inevitably get in her more trouble. The first issue sets up a treacherous web of complications for Sonja and frankly, we wouldn't have it any other way. Igor Lima's pencils are bold and exciting, keeping the pace at full throttle. The opening page alone is a work of art. Adriano Agusto's rich deep colors are what elevates the entire issue, instilling a familiar color palette for 'steampunk' with brown, yellow, gold, bronze, and of course Sonja's iconic red mane. The art is a beautifully rendered, choreographed, and paced. 'Legenderry Red Sonja' is simply a good time with one of the best characters in the history of comics. Andreyko, Lima, and Agusto keep the action going with an easy breezy script and bold art. If you don't like this then you must hate puppies, rainbows and the smiles of children. 'Sonja' is joyous entertainment.